Sleeps With Skunks and I headed to Mammoth Cave National Park on Saturday, November 22 for a three-day weekend. 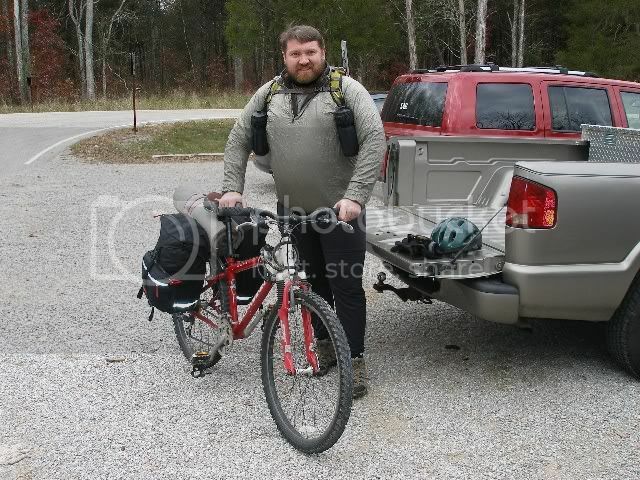 We mixed things up a bit, since SWS was going to hike while I rode the available trails in the Mammoth Cave backcountry. We each made our final preps at Maple Springs Trailhead. It was here that I realized that in the freezing conditions, my rear brake had frozen shut on my tire. I had to completely disconnect the rear brake and ride on the front only. I rode off 1.1 miles down Buffalo Trail, then headed south .6 miles on Turnhole Bend Trail to its intersection with Sal Hollow Trail. I dropped the paniers and my daypack and headed back up the Buffalo Trail. SWS was changing out her essentials into her tiny Flash Pack. 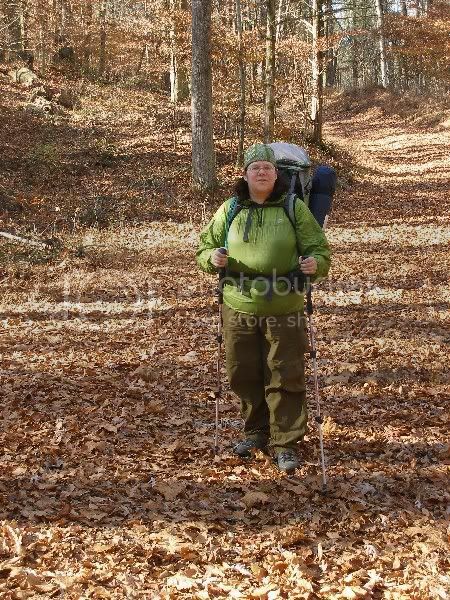 I then shuttled her large pack to the intersection with Sal Hollow Trail. SWS continued on Buffalo Trail 2.8 miles to Sal Hollow Campsite. 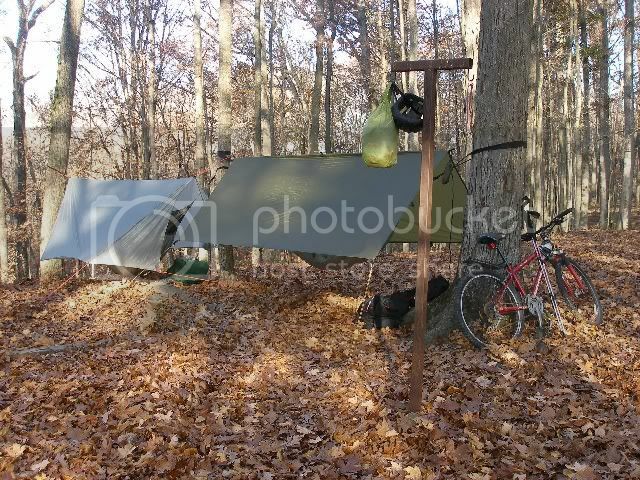 I rode back and cached all our camp gear near the intersection and proceeded the 4 miles by bike to Sal Hollow Campsite along the bumpy single-track Sal Hollow Trail. The trail was in much better shape than most single-track in the park (no horses), but it was still challenging with many rocks hidden beneath fallen leaves. I walked more than I liked, arriving at Sal Hollow about the same time as SWS. We enjoyed a quick, chilly lunch at Sal Hollow Campsite. 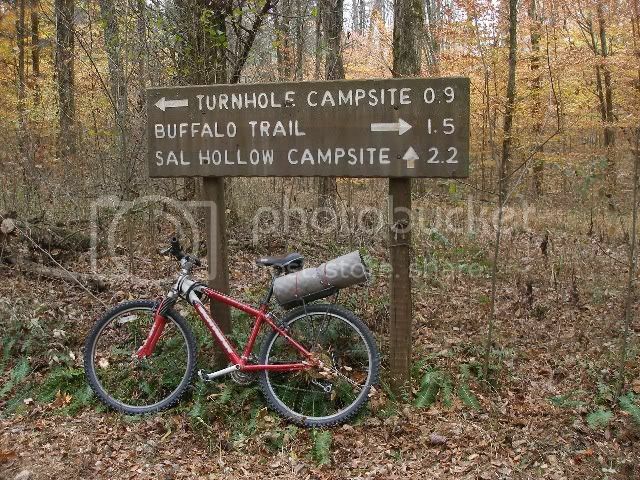 From there, I rode back on Sal Hollow Trail, recovered by gear, and rode on the 1.3 miles to Turnhole Bend Campsite. It was thankfully level riding after the difficulty I had on Sal Hollow Trail. The panniers were challenging enough. I arrived at the camp in time to have our hammock camp set up by the time SWS arrived. 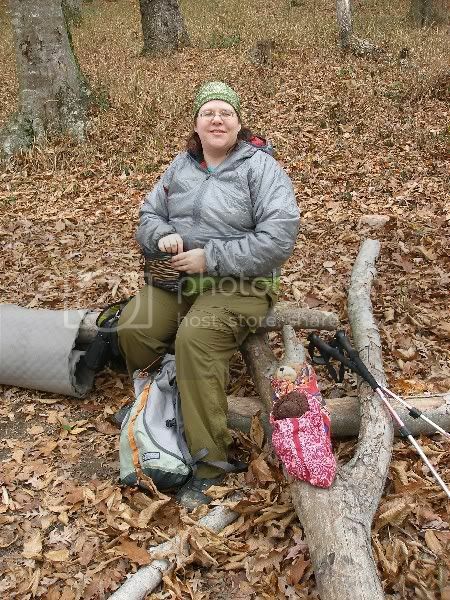 She set to gathering firewood while I made the 1/2-mile bushwhack to the Green River for water. Nine years ago, there was a solid trail all the way to the river. (I know because I hiked it). But now, it was a bit of a trudge. Once there, I had to walk a bit to find enough of a landing that I could get down to the water. The walk back was even more tiring. Once back in camp, we cooked dinner, and SWS entertained herself with maintaining a fire I started. It was nice to warm up a bit before turning in. The night-time low hit 22, but we slept warm and contented in our hammocks with both underquilts and pads. The next morning, we packed and headed out. We both took the 3-mile route out, straight up Turnhole Bend Trail andd out on Buffalo Trail. SWS got a good 20-minute head start while I finished packing up. But on my bike I was able to pass her fairly quickly. 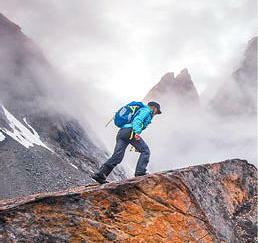 I arrived back at the truck, loaded my gear and walked back to meet her maybe a quarter mile from the trailhead. It was a pleasant walk together the last few hundred yards. not able to get out at the moment. Glad to see you both managed to hammock it down significantly below freezing there Bearpaw!